If you've never seen a cruise ship up close and personal, it is massive. In addition to serving as an incredibly stable environment for viewing seabirds, these huge vessels must look like islands to passerines and other non-pelagic species that find themselves far from terra firma. It is customary for at least some of the birders who go on repositioning cruises to rise well before dawn to walk the decks in search of nocturnal migrants that have either landed, or crashed onto the deck of the ship during the night. 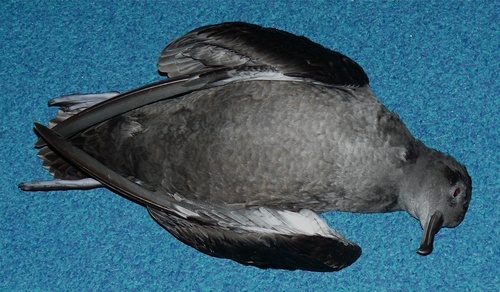 This Sooty Shearwater was found dead on the deck of the Golden Princess on 29 September 2008. We can only speculate, but it likely crashed into the boat during the night. It is well-documented that nocturnal migrants (particularly songbirds) are attracted to light sources and sometimes become disoriented by the lights of inner city skyscrapers. A cruise ship approximates a 90-100 story building laid on its side and surely the external deck illumination and the light emanating from cabin windows attracts birds. On all five of the cruises that I've gone on, we've found a variety of birds on deck during pre-dawn hours. Sparrows have generally been well-represented among the passerines we've found. 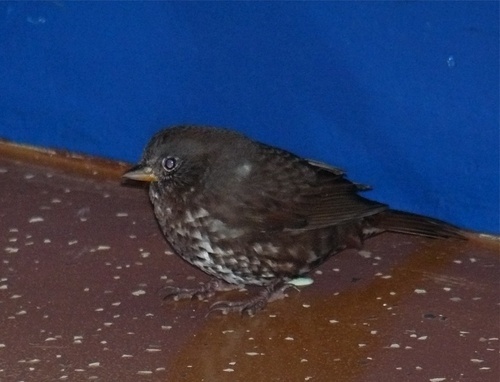 The immature Golden-crowned Sparrow pictured above came aboard the Star Princess more than 60 miles from land on 22 September 2009 and the Sooty Fox Sparrow below came aboard the Golden Princess a similar distance offshore on 29 September 2008. We generally find more ship-bound landbirds on fall trips than we do on spring trips. This makes sense because hatch-year birds making their first migration tend to comprise the bulk of birds found far off course. 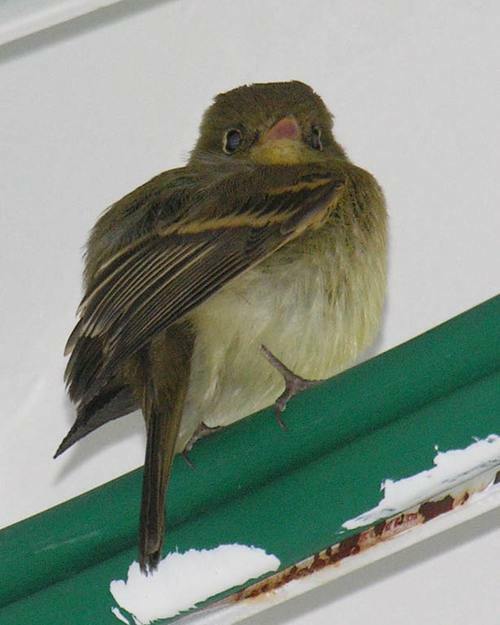 Sparrows and warblers have generally predominate among the landbirds we've found on deck. Landbirds are almost always alive and seeemingly in pretty good health. Conversely, seabirds tend to be injured or dead when we find them, suggesting that they crashed into the boat rather than landing on it on purpose. Leach's Storm-Petrels seem to end up wrecked on these ships somewhat regularly, particularly on spring trips. This immature Yellow Warbler, found on the Golden Princess on 29 September 2008, is the only passerine to be found dead on the trips I've made. In addition to birds found on the boat, many birds, presumably attracted to the lights, can be seen circling in the glow of the lights above the top decks of the ship. Phalaropes, terns, various other shorebirds, and assorted passerines have all been noted. During daylight hours, we've had dowitchers, Pectoral Sandpiper, and Black Turnstone come in and repeatedly circle the boat before eventually disappearing. Though I've not witnessed any of these birds landing on the boat, I suspect that they do on occasion. I can't recall the exact circumstances surrounding the discovery of this relatively bright Empidonax during a September 2007 cruise. It was first spotted perched above our scoping station in mid-afternoon and it may well have been there for hours before we noticed it. Hoping against hope that it was a Yellow-bellied Flycatcher, we ultimately determined it to be a hatch-year Pacific-slope Flycatcher. (Photo by Tom Shreve). Right on the money, Dave, regarding the lights attracting birds. I’ve been on 4 big ships and hitchhiking birds (or casualties) were on each one. Compounding the problem is the typical pattern of cruising itineraries. In order to maximize daytime visits to ports, night time travel puts ships in shallow, near shore waters impacting a greater number of birds. Hawaii now requires cruise ships to greatly reduce their nighttime light emissions during travel through their waters. Last fall on a ship bound for Hawaii, as we neared the islands, the Captain and the Environmental Officer repeatedly announced the regulations and what measures would be taken to darken the ship at night (curtains, reduced lighting on top decks, etc.) In addition to reducing the threat to birds, it became one of those teachable moments and people were generally interested in knowing more. Several years ago on a trans-Atlantic crossing from US to Britain I spoke with one of the officers (a keen British birder) on the QEII who had an on-ship list of over 200 birds. Most interesting was the Catbird he noticed shortly after leaving NYC and stayed on board to England and then on to the Mediterranean. Last he saw it was off the coast of Cyprus! I noticed on the most recent cruise that the exterior lighting on the ship seemed to be much reduced compared to previous sailings. The lighting around the top deck of the ship, which used to be fairly intense, was quite subdued this time. I got my life Gray Kingbird as it sat on a wire for an extended period of time on the SS Emerald Seas in route from Miami to Nassau on May 20, 1975. Dave, you’ve sold me. Excellent article on relocation cruise birding. Speaking of repositioning cruises, just read about the May 10th Holland America San Diego to Vancouver, B.C. cruise. Anybody going? I am thinking about it! Observed a Kestrel out in the North Sea on board Queen Mary 2 – last week. We saw about 12 finch-like birds land on the upper deck this week, between Faroes and Iceland. The closest species I could find in my birder’s guide was a Linnet. They appeared to be exhausted, and stayed on board for a couple of days. Has anyone else ever seen Linnets out to sea?